"Four children discover a strange life-form in the snow." When the snow falls, and goes on falling, Sam and Bridie discover a strange life-form in the snow. But are there more of them? And are they all as friendly as the first one they met? There may be great danger as the snow refuses to melt, and the country starts to freeze. It may be up to four children to save everyone. A Bit of Cold Weather at Upperworth has not been tagged yet. 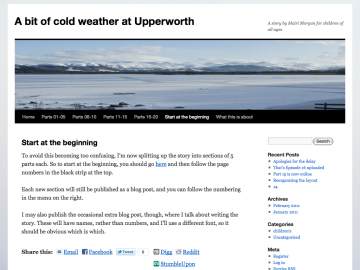 Help others find A Bit of Cold Weather at Upperworth by tagging it! A Bit of Cold Weather at Upperworth has not been reviewed yet. A Bit of Cold Weather at Upperworth has not been recommended yet.